Car Pretty LLC - Fender Trim - Stainless Steel, Black, Long, Short, Narrow and Wide Styles. Fender Trim - Stainless Steel, Black, Long, Short, Narrow and Wide Styles. 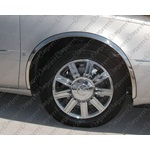 Car fender trim, truck fender trim that is polished stainless steel. Long, short with crease and with out crease.